Raise your hand if you like to entertain during the summer months? Are you going to be hosting a BBQ or ladies shower? 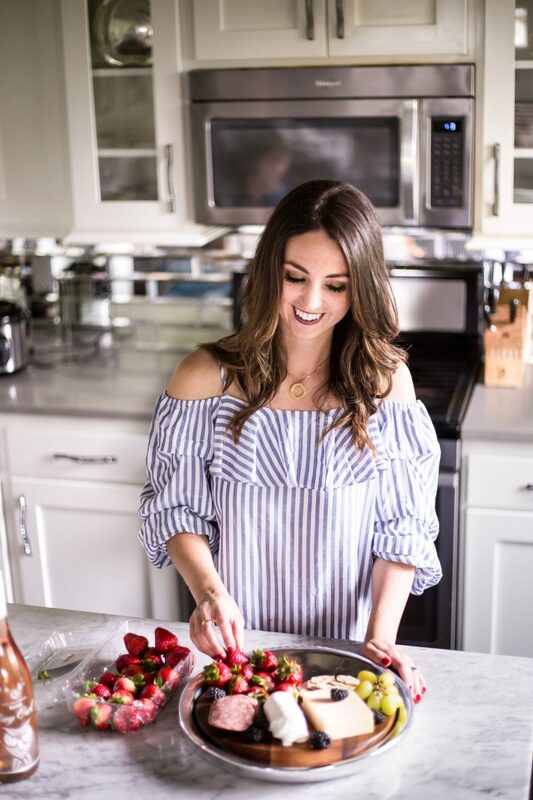 Now that we built our dream patio, I’m always looking for cute and practical ways to set up a buffet for when guests come over. So the other day I whipped up with DIY Silverware Holder. I think this would also look really cute hanging in a kitchen and you could put utensils in it! If I had a place for it in my kitchen I would definitely hang it there! This was really simple to make and could easily be done in a day (allowing for drying time). I used the same technique as I did for my Wall Hanging Succulent Planter so I used some of the same photos, but just picture this on a larger piece of wood. Paint your mason jars white. I think chalk paint would work best for this project. 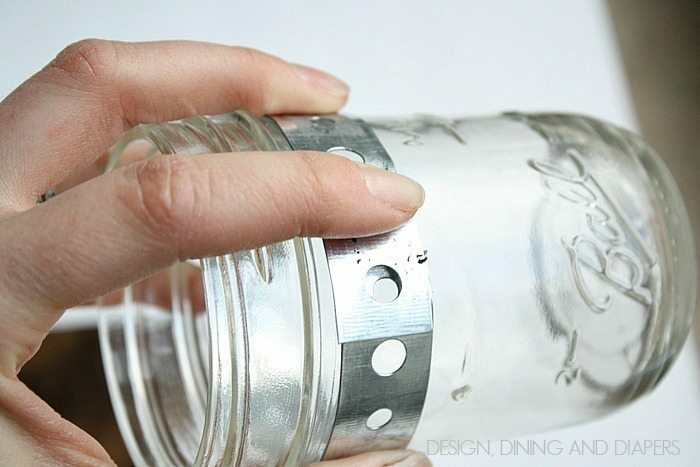 Size the galvanized plumbers tape around the mason jars (remember yours will be white and larger). Then screw the loops onto the board, three in a row. Place them slightly below the mid line so you have room for the silverware at the top. For the stencil, I created mine in my Silhouette program. Using Stencil Font and this utensil graphic that I altered. I thought I had this genius idea of putting shelving brackets on the back to help it stand up. Wrong. I had to place a stone on top of the brackets to weight it down. It worked but I wonder if there is a better way to make it stand up. Or maybe it would just work better as a wall hanging? Unlessss, you screwed the opposite side of the brackets into the surface. 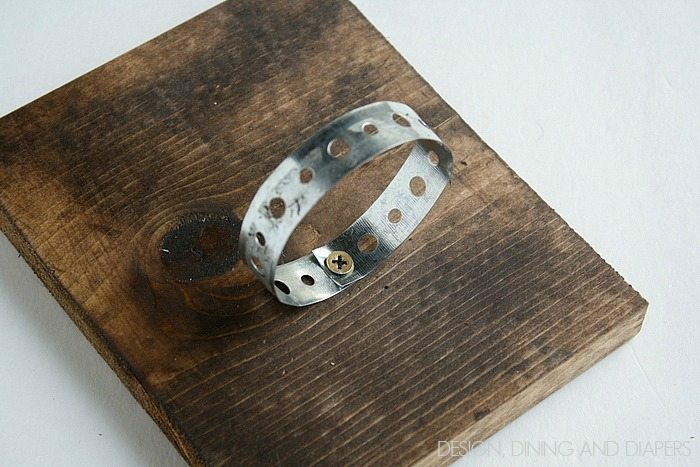 It would leave marks on the table but if you wanted a more permanent fixture it would work! I’ll let you decide, but I like the concept and I’m excited to display it during our next BBQ! Who wants to come over?! That’s awesome Taryn!! I love the stain you chose. This is would perfect in my kitchen actually! All of our drawers are so narrow that a utensil tray won’t fit so I keep my utensil in a utensil holder on the counter top. I love this idea!! This is so awesome, Taryn! I love this idea for my porch! So gorgeous and creative, Taryn! 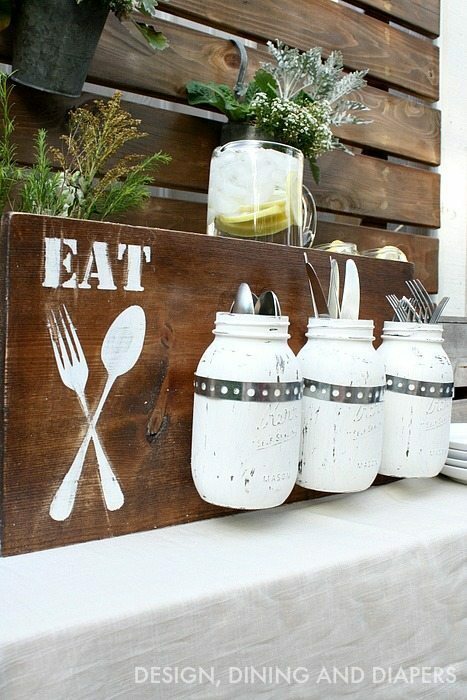 I love the way you painted the mason jars! Oh this is such a fun idea! I’m always just sticking silverware in random cups. How nice to have a pretty way to display and organized them! Tis’ the season for outdoor dining!!! You don’t often think of making a cute set-up for the little things, this is a lovely touch! :) Pinning! I love this! 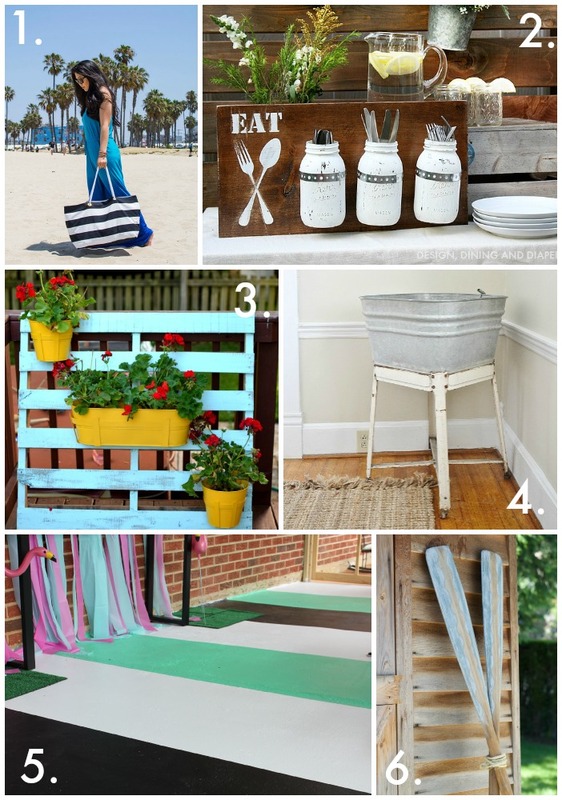 I love how its not only functional but also adds to your outdoor decor! Thank you! I’m all about being functional! You seriously come up with the cutest stuff, Taryn! 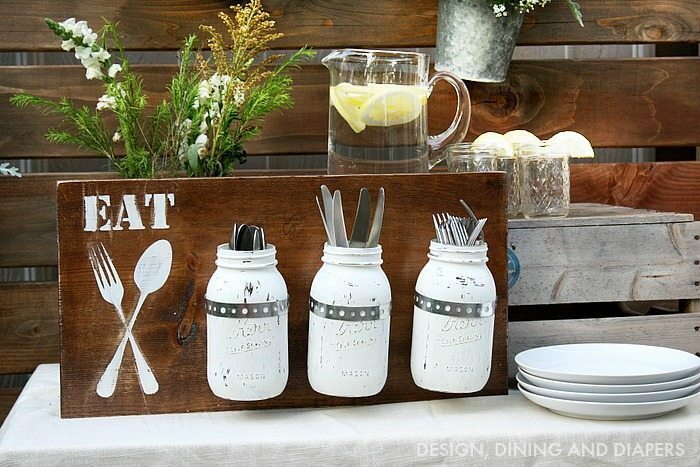 I’m loving this silverware holder for outdoor entertaining! That looks great! What an awesome idea! This is a lovely idea. It looks great. I think the brackets on the back with the great big brick to weigh it down seems like a great idea to me. You are keeping the whole thing very flexible – it can be moved, used anywhere. Once you permanently attach it to something, that’s where it stays! Taryn, absolutely in love with this! You are so creative… and I’m always in love with your sense of style! I love this silverware holder. What a great idea for outdoor bar-b-ques. 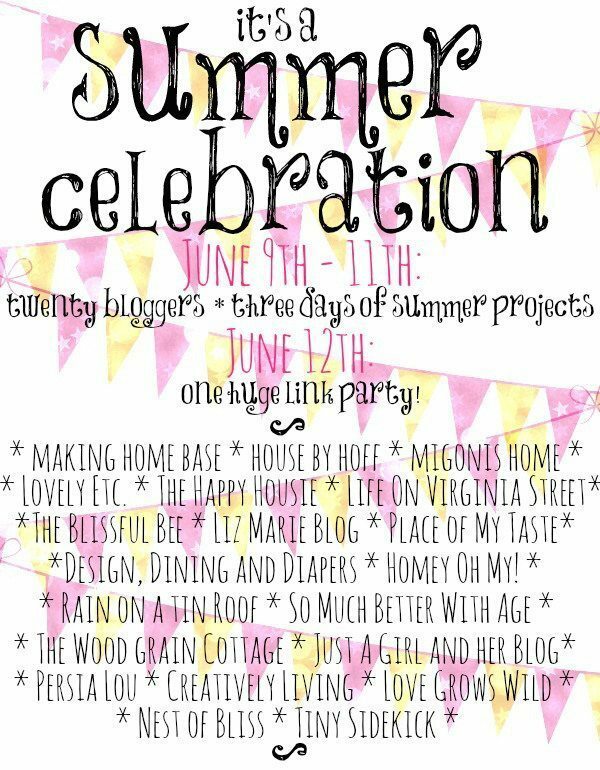 I would love it if you linked this up at my Motivate Me Monday linky party! I have a question about the galvanized plumbers tape. 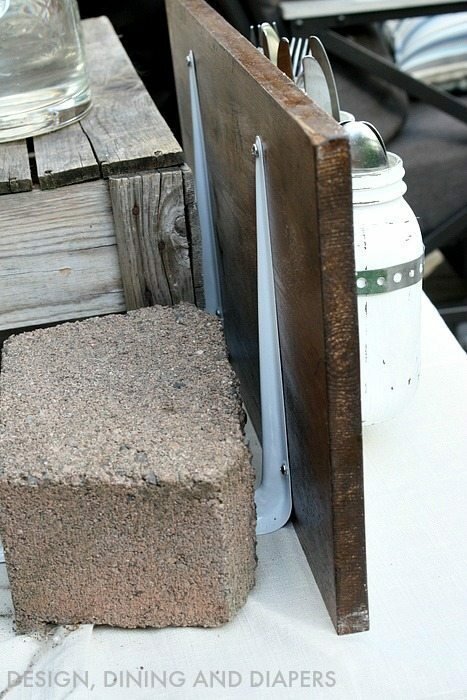 After you set it and attach it, would you then just slip the mason jar in and if so does it scratch off the paint. It looks so much simpler than some others tutorials I have seen. And could this tape be painted? 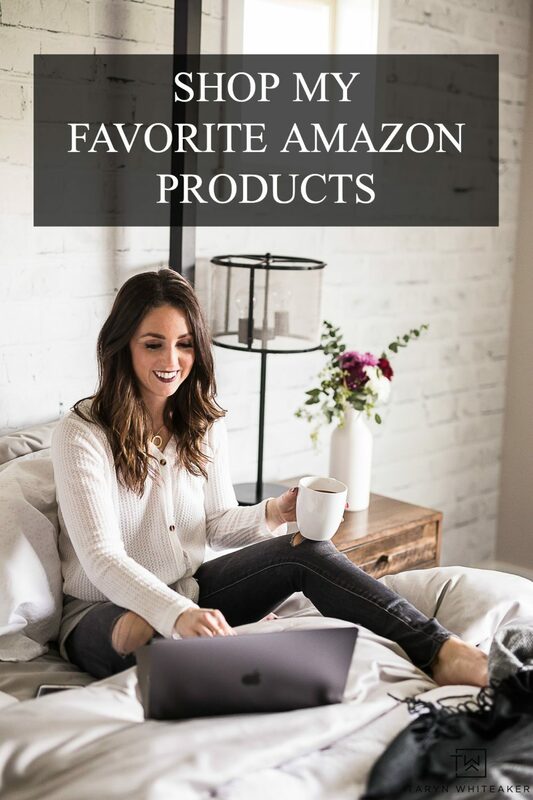 Thank you so much for your post! It looks so cute! Hi Tammy! Yes, I just slipped the mason jars in. The metal did scratch off a little more paint off the jars, but since mine were already distressed it didn’t bother me. 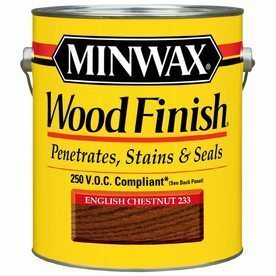 You could definitely paint the tape, I would just recommend using a primer first since it’s metal. Hope that helps! U brackets placed on back hang on pallet wall that’s secured. Can add L shaped shelves for plates, cups etc. 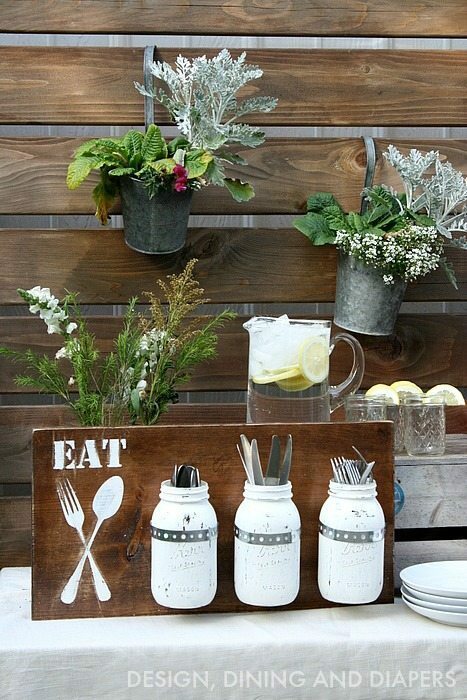 A bbq\party pallet wall! Love the utensil idea!